The Young Alumni Ambassadors are an exclusive group of passionate Falcons that are instrumental in supporting other graduates in their transition from moving to a new location or career fields. We rely on ambassadors to be strong guides to fellow young alumni members and assist in sharing ideas to the AOG in relation to programming and events designed for you. 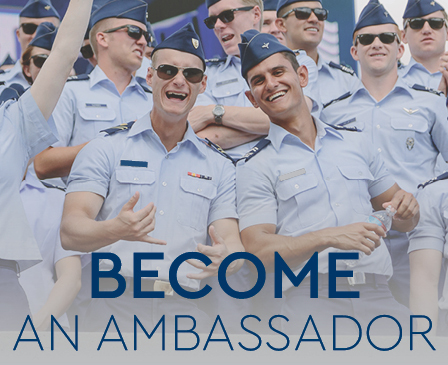 Our ambassadors are comprised of alumni who have graduated within the past 14 years and must complete our application process to be selected to serve you. We are continually recruiting new ambassadors that span across the globe and come from various career fields within and outside of the military. If you are interest in requesting to be connected with an ambassador or to becoming one, click the links below. It is free and easy to join! Are you a grad who recently moved to a new area? Let your ambassador know you exsist! Want to network with other grads in your field? We can help! Considering changing career field? Your ambassador can share some helpful tips! Do you want to make new friends? Who doesn't like friends? Our ambassadors are your resource to navigating a new city, sharing insider tips on careers, and helping you build a vast network of forever falcons. Do you know all the great spots in your city? Of course, you're the life of the party! Have you rose in the ranks or ventured on to other careers? Your advice is priceless! Have an urge to make a difference in someone's life? We'd love to help! As an ambassador you will play a crucial part in helping other grads as they navigate new cities, careers, and be the foundation to build a network of forever falcons. 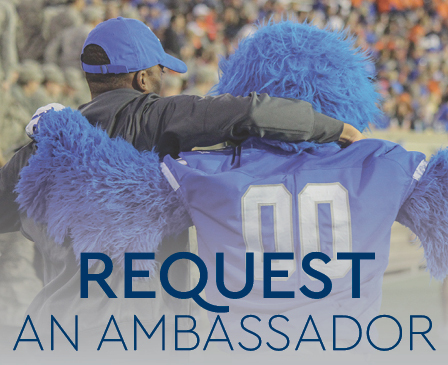 *Not only will you become an ambassador BUT we will also provide you with your own ambassador mentor. It's a win-win!